We've seen double-digit rallies in both U.S. and foreign stocks. And the precious metals market has also started to take off. Simply put, the U.S. agriculture market continues to be a poor performer in 2019. And investors are finally throwing in the towel. Agriculture isn't an exciting market. I get it... It's not the next disruptive tech sector that's going to change the world. But when negative sentiment reaches extreme levels in this market, big gains are possible. The rubber band always snaps back. And it's stretched far right now. This negative sentiment is starting to pile up in the agriculture space today. 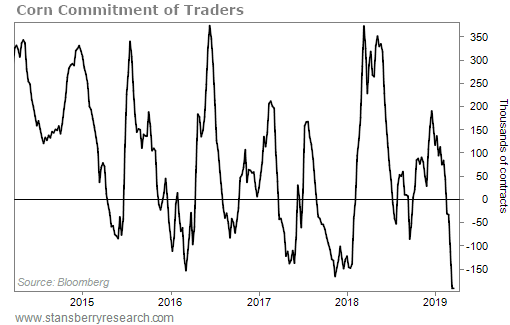 And we can see it through the Commitment of Traders ("COT") report. 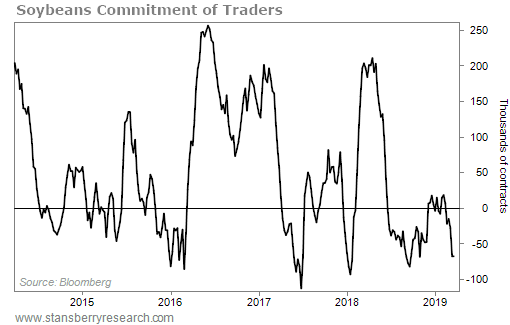 The COT report is a contrarian indicator that tells us what futures traders are buying in real time. When futures traders are all making the same bet, they're often wrong... And the opposite will likely occur. Futures traders are making large bets on lower corn prices. In fact, today's negative sentiment is the worst we've seen in years. And that means higher corn prices are likely from here. We saw similar examples in both September 2016 and November 2017. Both cases preceded rallies of 15% and 17%, respectively, over the next six months. Bets on lower soybean prices are also near multiyear lows. And again, that's a recipe for higher prices in the months ahead. Solid returns followed similar cases in 2016 and 2017. Those both set the stage for 30% and 10% gains, respectively, in less than six months. The last major agriculture commodity is wheat. And while wheat isn't at multiyear hated levels right now, investors are heading for the exits. It's just a matter of time until this commodity also reaches outsized levels of negative sentiment. The most interesting part of all this is that investors don't just hate one agricultural commodity today... It's the entire agriculture market. And today's negative sentiment is setting up a major buying opportunity. When the uptrend returns, shares of the iPath Bloomberg Grains Subindex Total Return ETN (JJGTF) will likely be the big winner. The fund allocates 37% of its portfolio to corn, 38% to soybeans, and 18% to wheat. When the rubber band snaps back in the agriculture market, this fund will likely lead the way. "This will change the way many people live their lives," Thomas Carroll writes. "And importantly, it is also a huge new product market where we can invest." He says a boom is happening in another corner of the agriculture market right now... Learn what this means for the years ahead right here. "The best and brightest are getting out of commodities once again," Steve says. "It's a major shift from one of the world's most powerful investment banks." Get his take on one major event and the impact for the commodities sector right here. Ameren (AEE) is an $18 billion provider of gas and electricity in Missouri and Illinois. It serves 2.4 million electric customers and nearly a million gas customers. 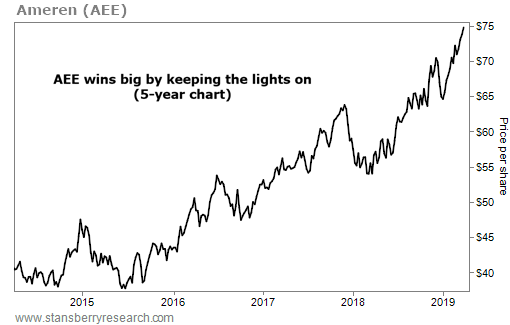 That’s a lot of folks turning on the lights every night… So it’s no wonder sales have topped $6 billion in each of the past five years. Plus, profits hit $815 million last year – up a whopping 56% from 2017 – partly due to colder winters and warmer summers.